You are quite amazing — and funny — and I am most likely predictable. You were right in guessing that there was stewed fruit involved in my dessert. What else? I could well have used tapioca — actually I did too one evening to use fruit leftovers — but instead, my dessert was an unpretentious rice pudding. To make P. happy. Because rice pudding is really a special dessert in his eyes. In fact, both P. and I are big fans of rice pudding. Moi ? It brings fond memories of my childhood when my grandmother used to make it for us at the farm. I doubt that she was using Arborio rice then but nonetheless, her rice pudding was authentic, the quintessence of comfort food: she would use the milk they produced and the fruit they grew. As to P. ? I am actually not sure. All I can see today though is an obvious well-anchored history with this dessert: he simple adores rice pudding. So much so that he often begs for me to prepare it, especially on evenings when we are short of dessert ideas, feeling that yogurt, un carré de chocolat noir or a piece of fruit is not enough to satisfy our sugar craving. With this in mind, I cooked rice pudding a few times this past week, and made tapioca pudding too. At each time, I chose to use coconut milk instead of regular cow’s milk. A pretty welcoming twist to the traditional dessert. My rice pudding has simple quality ingredients: Arborio rice, rhubarb, strawberries, coconut milk, grated coconut and a tiny bit of sugar. I like the idea of mixing cooked fruit with raw pieces for a contrast of textures and food temperature, and add crunchiness by topping the dessert with coarsely chopped green pistachios and slivered almonds. This recipe is simple to make and fairly quick to assemble. We also like to eat rice pudding warm, so this is how I typically prefer to serve it. So yes, perhaps I am talking about spring as if it were here already, and frankly I really wish for it now. But there are really worse things that can happen than long for spring, non ? 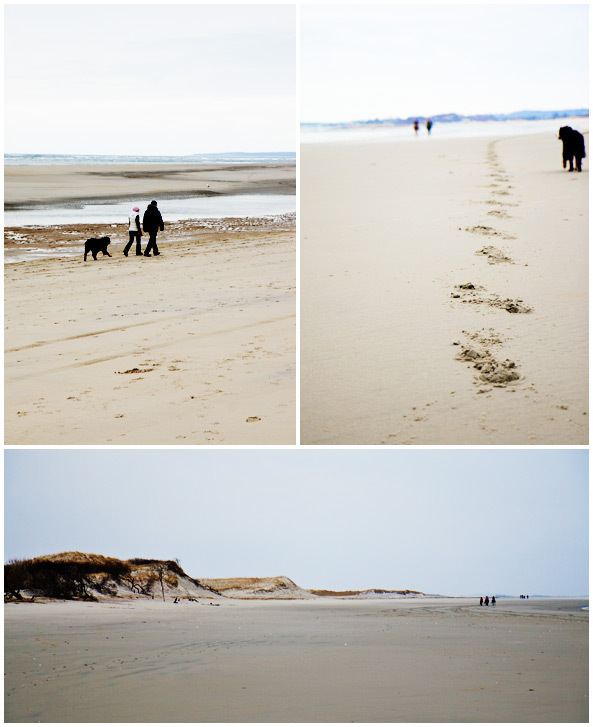 In fact, we did not even mind seeing snowflakes today during the lovely walk we took with our friend K. and her dog at one of our favorite beaches — empty besides a few horses, walkers and dogs. Instead, it gave us a really good excuse to comfort ourselves with a nice dinner — probably a vegetable stir fry with salad — and finish it with rice pudding, once again. What else is there on Sunday evening, I ask you? Note: I have reorganized the Recipe Index and added a Link page, as you can see in the menu options at the top, and on the right panel of my site. Take a look. The recipe index is nearly finished, but I will keep working on its format until I find one that I am fully happy with. So come back to see the changes. To prepare the fruit, dissolve 1/3 cup sugar with 2 Tbsp water and add the strawberries and rhubarb with the cinnamon and vanilla seeds and pod. Simmer until the fruit is tender (about 15 min.) Remove the vanilla bean, let cool and divide between 4 glasses. In the meantime, rinse the rice under cold water and drain. Heat the coconut milk with the cardamom pods. When it reaches boiling point, add the rice and mix. Cover and cook on low heat for 25 min or so, until most of the liquid is absorbed and the rice is tender. Mix a few times while cooking. Discard the cardamom pods and add 2 Tbsp sugar; mix. Serve lukewarm on top of the stewed fruits and add the nuts and fresh strawberries. Pour préparer les fruits, faites dissoudre 70 g de sucre dans 2 càs d’eau et ajoutez les fruits et la cannelle avec les graines et la gousse de vanille. Faites compoter doucement pendant environ 15 min à feu doux. Retirez la gousse et laissez refroidir avant de diviser entre 4 verres. Pendant ce temps, rinsez le riz sous de l’eau froide. Égouttez. Dans une casserole, chauffez le lait de coco avec les capsules de cardamome jusqu’à la première ébullition. Versez le riz en pluie, mélangez et faites cuire à couvert sur feu doux pendant environ 25 min. Mélangez de temps à autre et vérifiez la cuisson du riz (tout le liquide doit être presque absorbé). Retirez les capsules de cardamome, et ajoutez 2 càs de sucre; mélangez. Servez tiède sur la compote de fraises/rhubarbe avec les noix concassées et les fruits frais. Wow, totally drool-worthy, both the photos and the recipe. And perfect timing, too. A friend just brought me some cardamom from Cambodia (photo here), and I want to do some fun things with it. Mmmm I love ococnut rice pudding and eating it with the berries sound delicious. Wonderfull photos. 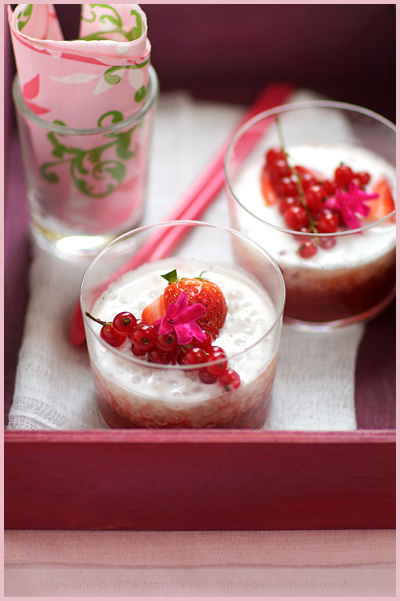 Delicious looking rice pudding! I need to make more of this…rice being so popular in my country (as is coconuts)! Rice pudding is simple but so comforting. It brings back childhood memories for me as well. That first photo with the flower and all that light… Let me know if you are going to be teaching any photography seminars because I will be there! Beautiful! 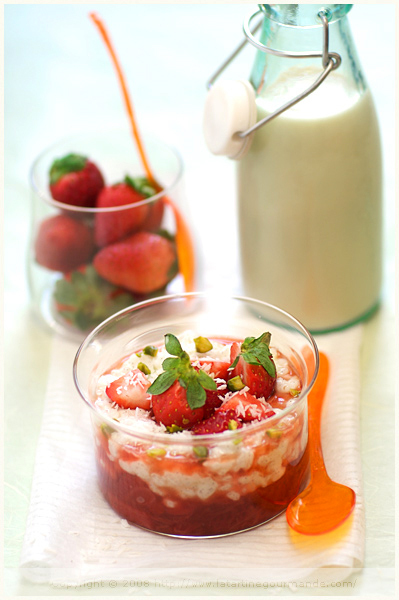 Love rice, strawberry and beach, so thank you for this comfort recipe! Oh Bea, that’s lovely! Can’t wait for the spring either but at least it’s strawberry season around where I live. Vraiment tout ce que j’aime dans ce pouding au riz bien parfumé! Ooh, I don’t like regular rice pudding but coconut milk in it might just sway me! Can’t wait for spring,too! The pudding looks fantastic! Could you tell me what brand of coconut milk do you use? I’ve tried many and none of them had a strong coconut flavor. Looking at those pictures makes me wish that the view outside my window wasn’t still filled with snow and cold. Sigh. Bring on l’été! We use coconut milk a lot in the South East Asia desserts, I would have no doubt that the taste of this rice pudding would conjure up my childhood memory too! Nice new layout! i love the idea of replacing the milk with coconut milk – totally trying this. Your food photography absolutely cannot be matched! WOAH! Gorgeous, yummy stuff. And it’s lovely rice pudding for dinner again! rice pudding and tapioca pudding both sound delicious! A good rice pudding is the food of the gods. Pink and lovely. Looks yamy too. Et dire que je suis la seule adepte du riz au lait à la maison, quel dommage, ils ne savent pas ce qu’ils perdent! 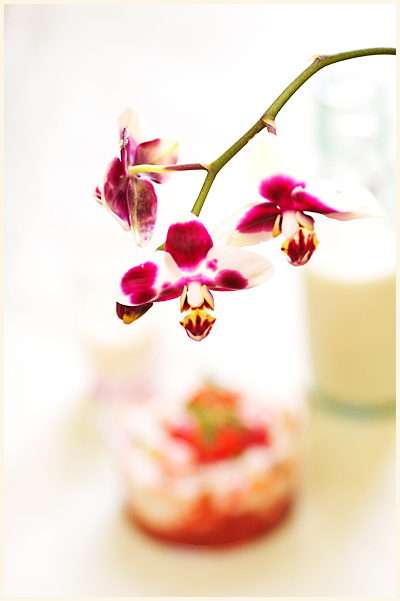 Oh goodness Béa even rice pudding looks heavenly in your photos. It looks like strawberry/rhubarb soup it floats in and I would simply love to have a go at it! that looks beautiful! and your dog is so cute — it looks like a little black bear running along behind you! Love rice pudding especially one made with arborio rice. I made mine with chocolate not too long ago. Lovely pics! Many thanks everyone. I am glad to hear that I am not alone to love rice pudding with coconut! 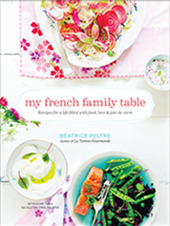 How could we resist, n’est ce pas ? Rice pudding is incredibly comforting to me, Bea (it reminds me of my mom). But I have never tried it with coconut – the idea sounds so wonderful! Sorry I forgot to answer your question. I have used a lot of different brands too. I will have to dig the info, as I cannot remember from the top of my head. Non seulement la recette a l’air réconfortante et pas trop lourde, mais en plus je dois dire que les photos sont vraiment ma-gni-fiques!!! j’adore!! Ooooooooe! la la I love desserts with rice and coconut.As thet say in Afrikaans LEKKER!!!! ( Sooooooo goood)! On est en plein ete ici, mais il pleut sans arret et j’ai envie du riz au lait. Merci pour cette recette, car je le fais toujours au lait de vache et canelle. Au lait de coco ca va changer! 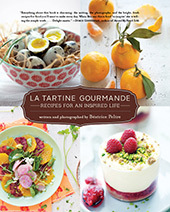 J’adore tes phots et tes petites histoires, et bien sur tes recettes! This Coconut Rice Pudding looks so gourmet!!! Je vais essayer ca de mon cot� et je reviens vers toi d�s que j’ai des nouvelles. Tr�s bon th�me 🙂 Chef Tiramisu.